This week's Top Ten Tuesday is a rewind, which means we can chose any topic we like. I was inspired by Book Riot's open thread last week that asked you to name five authors you are ashamed to admit you haven't read (yet). Well, even more shameful, I've got ten. 1. Charles Dickens: I think a lot of people started with Dickens in school, probably with the assigned reading of Great Expectations. Well, I must have missed that class and somehow went until the age of 26 missing Dickens altogether. For shame. 2. Thomas Hardy: I feel like Hardy is a favorite among many readers. He published 18 novels, a plethora of short stories and works of poetry, and even a few plays. That's a lot to choose from, yet I haven't read one. 3. James Joyce: Joyce is one of the most celebrated authors of the 20th century; he holds the number one spot of the MLA's best 100 novels with Ulysses, but I still haven't picked him up. 4. Evenlyn Waugh: Another favorite among book bloggers, I'm ashamed to admit I wasn't even aware he was a male until the last year or so. 5. David Foster Wallace: I must admit, Wallace's Infinite Jest is probably the book the intimidates me the most, of all the books, ever. I've avoided his work because I think it would be too challenging for me. However, I've had a copy of Consider the Lobster on my shelf, unread, for a good three years now. I really should pick it up. 6. Leo Tolstoy: That is just embarrassing. 7. Anita Bookner: Another favorite among book bloggers, she wrote a couple dozen books. Anyone know which is a good one with which to start? 8. Cormac McCarthy: I do have The Road sitting on my nightstand, so hopefully I can cross him off this list this year. 9. Barbara Kingsolver: When I was 12 or so I remember all of my teachers and friends' moms were reading The Poisonwood Bible. I tried to read it then and only got a few pages in when I realized it was way over my head. I've always wanted to read it as an adult but haven't yet gotten there; La Lacuna and The Bean Trees also sound good. 10. Muriel Spark: I really have been meaning to get something of hers because her novels sound so fun and unique, especially The Prime of Miss Jean Brodie. Yay for Dickens! It took me awhile to appreciate him, but Great Expectations is a wonderful place to start. I read my first Hardy (Jude the Obscure) last year and I was blown away. On Joyce, Ulysses is so intimidating, but Dubliners is accessible. For the longest time I didn't know Waugh was male either! Brideshead Revisited was my first of his books. Definitely start with The Poisonwood Bible. I think Bean Trees is a bit of a disappointment. I wasn't a fan of Spark's Prime, but maybe you would be. Cormac McCarthy and Barbara Kingsolver are two of my favorite authors! I hope you get to them soon and like them as much as I do. Best to start with Kingsolver's Bean Trees if you can - it's is a wonderful story. And McCarthy's All The Pretty Horses is a good one of his to start with. The Road is excellent too, it's just a little weird and dystopian. Good luck with your pursuit of these wonderful authors! I must admit I haven't read David Foster Wallace either even though I've had him on my TBR shelf for months. Both of you and Brenna should start with his non-fiction. You'll be seduced. His fiction is a lot more difficult. As a reader, you shouldn't be ashamed about anything, I think. There are good writers you're missing out on. I like Wallace and McCarthy a lot on that list, but there is no obligation as a reader. You're doing already much more than most. Since you already have Consider The Lobster, let me recommend a few essays from that collection that are especially great. "Up, Simba" is about the McCain campaign in 2000 and was originally commissioned for Rolling Stone. Although Wallace traveled with the McCain press corps, he never interviewed McCain, instead focusing on the people behind the scenes - like the cameramen. "Host" is profile piece about conservative talk show host John Ziegler that spends a lot of time asking "is this guy for real?" "Authority and American Usage" attempts to be a review of a usage dictionary, but instead delivers an essay on the "usage wars" and a bit of family history. You could read any one of those in a sitting and then be able to claim that you'd read Wallace! Easy! Finally, Infinite Jest isn't really that hard. It just looks hard and people talk about it being hard, but compared to Pynchon's Gravity's Rainbow or Gaddis - it's fairly easy. Ulysses is a super intimidating book. Most people would recommend starting with Portrait of the Artist. I'm not a huge Joyce fan in general. I'm also really afraid of DFW. I know I need to get over it. I will tackle Infinite Jest eventually. Wonderful list -- this cracked me up. I read my first Hardy last summer -- and adored it -- so there is something to reading him. Some of the others I'm totally 'yawn' about -- David Foster Wallace, Cormac McCarthy -- and on my list, Jonathan Franzen and Michael Chabon. I don't think it's so bad that you haven't read some of these. A lot of kids get classics pushed on them when they're young and that results in hating reading. I read classics in school and didn't really understand them, so I'm trying to read some more now that I'll be able to appreciate them more. That being said, I haven't read most of those authors either! While I have read most (not all) of these authors, I have been meaning to read one of Tolstoy's books. They are incredibly lengthy and I imagine that is one of the reasons. I am trying to take on longer books in exchange for quantity this year. Although not in the league with these literary greats, I am reading my first Stephen King novel, The Stand, which is a long one as well. I'm right there with Kingsolver, although I just picked up Vegetable, Animal, Miracle. I haven't read Waugh either. For the Brookner, I like Providence. From your list I haven't read an entire novel by Wallace and Cormac McCarthy although I've tried both and can't seem to make it past a few pages. My fave's on your list are Thomas Hardy and Evelyn Waugh who wrote two books that are on my all-time best of list (Brideshead Revisited and A Handful of Dust). Interesting topic - I'm always ashamed of having not read a few classic authors like Hemingway and Tolstoy - since I was an English major and all. It's funny how some of that just depends on what your high school teachers/college professors picked for your classes! I'm not sure I would have gotten any Dickens in if it weren't for a British literature class, but I did really enjoy Bleak House and have meant to read others. I LOVED The Bean Trees by Barbara Kingsolver. I picked it up only because my daughter had to read it for school. I'm glad I did. Amazing. This is a great list idea! I've read a few of these but I know there are some authors I still haven't read yet either. I've tried quite a few of the authors on your list and in most cases I wasn't very impressed. I wasn't a big fan of Kingsolver, Waugh, Joyce, Brooker or Spark. The only one I loved was The Road - it is gripping, but very dark. I didn't try Dickens until I was about 30. I missed out on him in school too. I did enjoy Great Expectations, but it was a lot of work and I haven't been inspired enough to try any of his others. 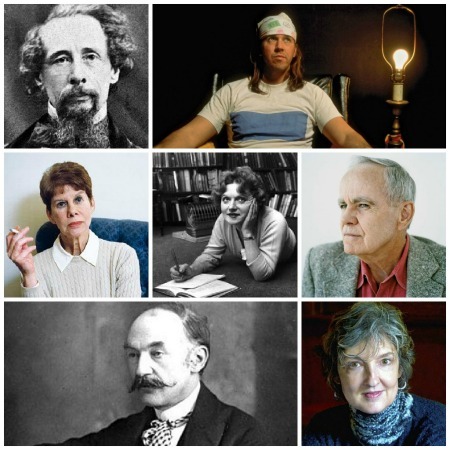 I wouldn't worry about not having read these authors - you've found a lot of other great ones over the years! I laughed when you made your comment about Tolstoy. I'm guilty, too. You inspired me to host a read along for Anna Karenina. So, on to my first Tolstoy book. I will no longer hang my head in shame. I've read all but David Foster Wallace, though I've only read a couple of Joyce stories. I was underwhelmed. I do like some of Waugh and most of Dickens, and I have mixed feelings about Tolstoy. The best thing I've ever read by him was The Death of Ivan Ilyich, which is really a novella. A good place to start with Tolstoy.